We got a lot of calls for grill repair and maintenance during and after the July 4 holiday. When grills are put to the test during large cookouts, small problems become large ones. You didn’t want to miss the fun or a big fireworks show because you were trying to prepare a meal and your nice Wolf grill malfunctioned. Before you call us for help and incur a service charge, try troubleshooting the problem with these 8 tips. Push the burner control knob in and verify that the igniter glows. If not, check to see if the grill is plugged into a 120V AC electrical outlet and that the GFCI has not been tripped. For now, light the burners manually. Purge the fuel line of trapped air. Burner flame is yellow and you can smell gas? 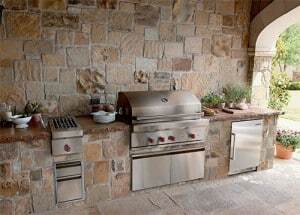 Inspect grill burners for obstructions such as nesting spiders and insects. Contact C&W Appliance Service or your gas supplier to check for a gas leak. Burners do not provide enough heat? Check for a proper gas supply or check your propane tank to make sure it’s not empty. Make sure the gas supply hose isn’t bent or kinked. Check for nesting spiders and insects in the grill burners. Remember to preheat the grill for 10 minutes before you plan to cook. See that the grill is getting the right level of gas or check the propane tank to make sure it isn’t empty. Provide a wind block if your cooking area is exposed to high winds. Clean the burner grates with a damp grill brush. Cooking heavily marbled or fatty meat may cause drips to fall into the flames. Ensure that cooking temperatures are not too high. Interior or control knob lights will not operate? Check that the unit is plugged into a 120V AC electrical outlet and that the GFCI has not been tripped. Hot surface igniter will not operate? Verify that the grill is plugged into a 120V AC electrical outlet and that the GFCI has not been tripped. Thermometer not reaching high temperatures? Operate grill on high for 10 to 12 minutes with the hood closed to reach higher temperatures. Don’t miss out on the fun of summer gatherings. Save yourself a lot of frustration as well as the price of a service call by following these troubleshooting tips for your Wolf grill. If that doesn’t work, then contact C&W Appliance Service, the only Sub-Zero and Wolf factory-certified premier partner in Dallas, Fort Worth and San Antonio, call us at (855) 358-1496.